Hey guys! Sarah from Little Red Brick House back again sharing another project! Thanks for having me, Maryann! I’m really excited to share what I’ve been up to these past few weeks. I’ve been working hard on getting my living room decorated and I am very happy with the progress I’ve made in there. 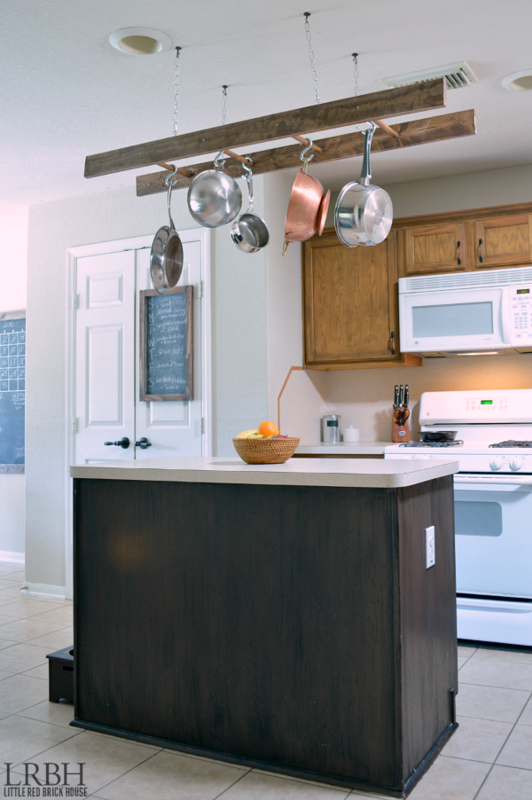 When it comes to home decor projects, I can’t sit still for long, so on to the kitchen it is! We have a good amount of storage in our there for our needs, but sometimes it’s not the easiest thing to go digging through cupboards and drawers looking for the pots and pans. I decided it would be great to have them hanging from a rack above the island. One day, after unsuccessfully searching for a rack that I liked, inspiration struck and the idea to hang them from a ladder was born! 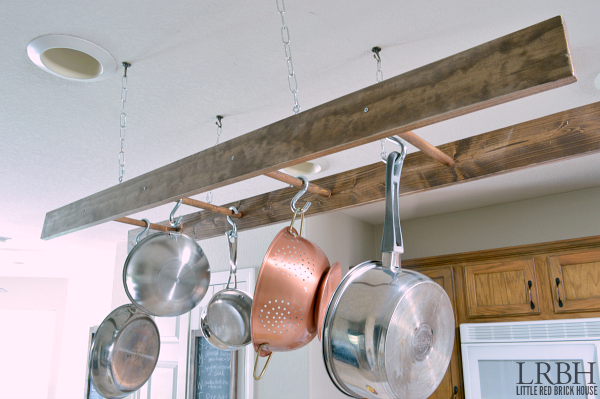 Luckily, the previous owners of our home left the hooks to their pot rack installed, so we didn’t have to worry about finding the studs and mounting them ourselves. I started with two 1×4 boards, cut to 5 feet. 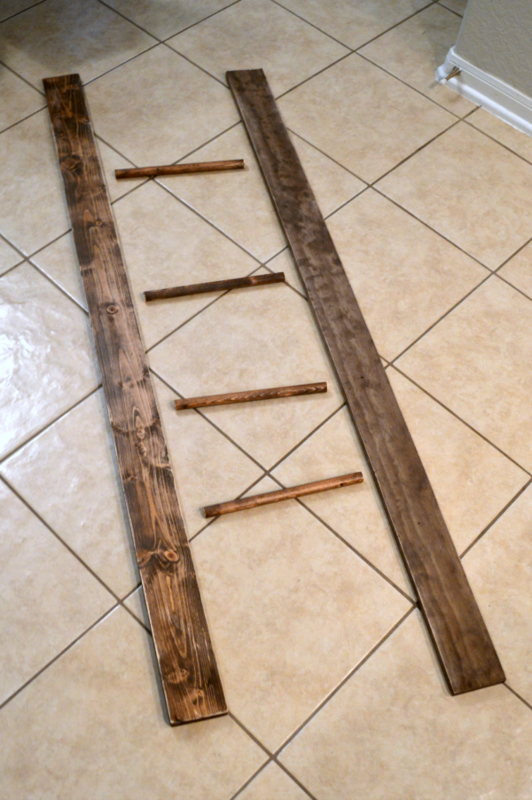 I also had a 3/4 inch wooden dowel cut into 11 inch segments to act as the ladder rungs. I stained them with Rustoleum Dark Walnut stain and distressed the corners and edges with a sander once it dried. 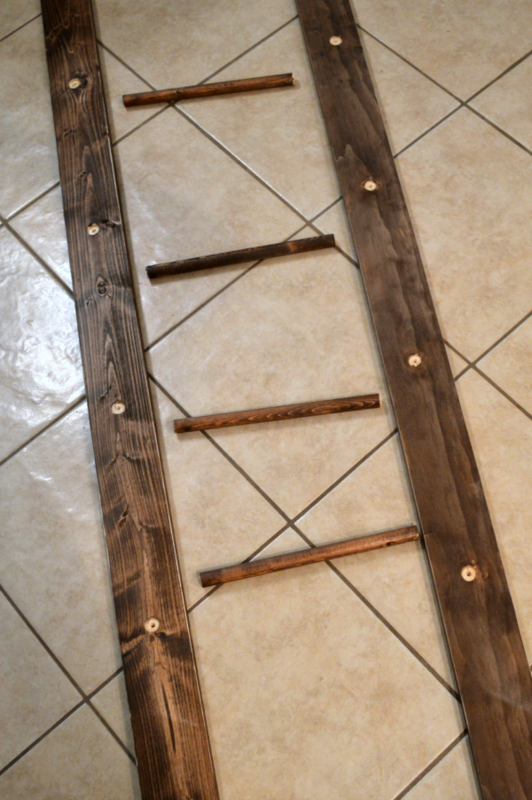 I spaced out how far I wanted my dowels (11 inches apart) and drilled a few holes (equal to the diameter of the dowels) halfway through the sides of the ladder so that the dowels would sit countersunk into the sides for better support. Next I used a drill bit to pre-drill holes through the dowels and the sides of the boards so that they wouldn’t split when I screwed the dowels into the sides. I used 1 1/2-inch screws and wood glue to attach the dowels to the boards. And the ladder was complete! Time to assemble the hardware. 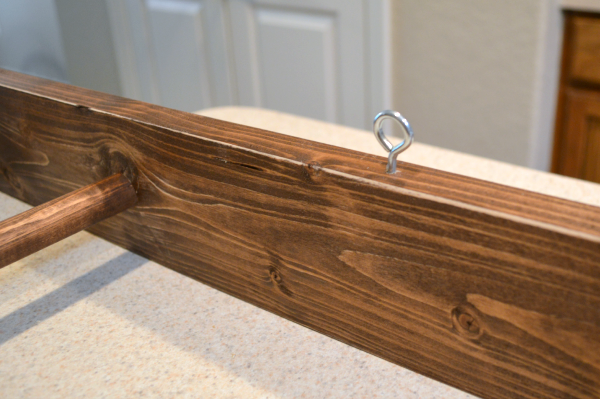 I attached some 1 3/8-inch eye screws into the ends of each side of the ladder. 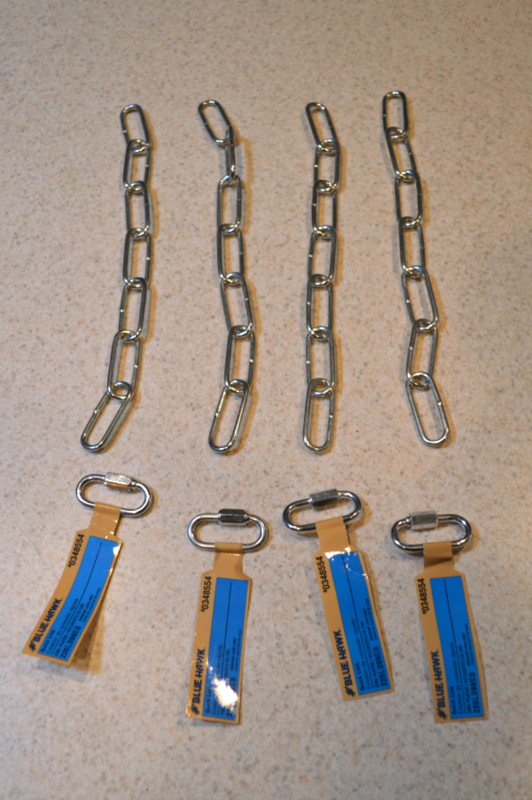 To hang the ladder, I used a chain that was cut into about 11-inch segments (7 chain links each). 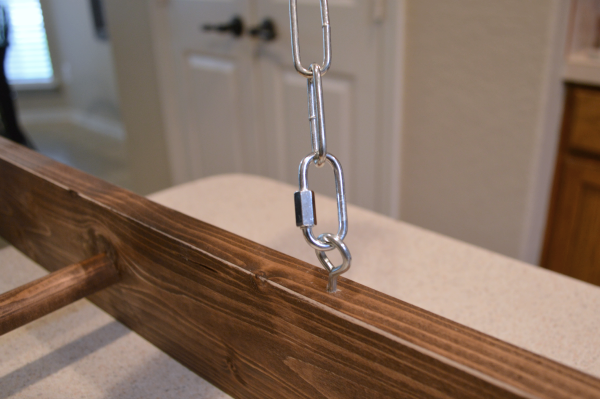 I also used a few quick links to attach the chain to the screw eye hooks. You can unscrew the little bolt part and then tighten it back up when you’re done hooking it through the screw eye. 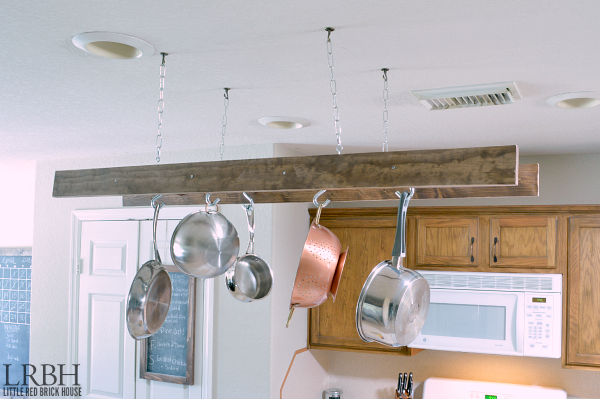 With the mounting hooks from the previous owners already installed, all I needed to do was hang the ladder pot rack! 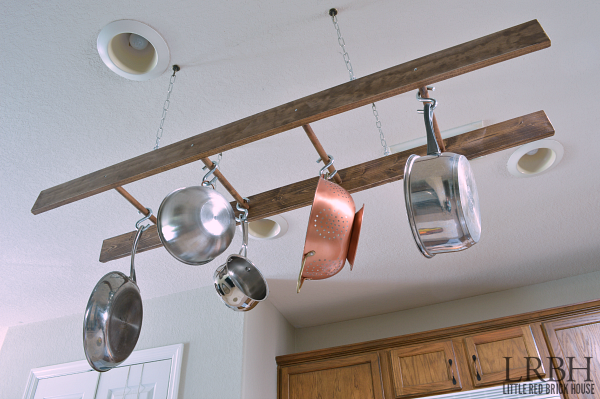 I used large, 3-inch S-hooks to hang a few pots and pans and also a colander and mixing bowl. I just love it so much and it’s really nice to have my most used cooking tools right at my fingertips! Next thing on the list is to paint those cabinets. That orange stain has got to go! Thanks again for having me. I look forward to sharing another project with you all next month! Until then you can catch up with all of my other DIYs on my blog and follow along with me on my social media outlets below. 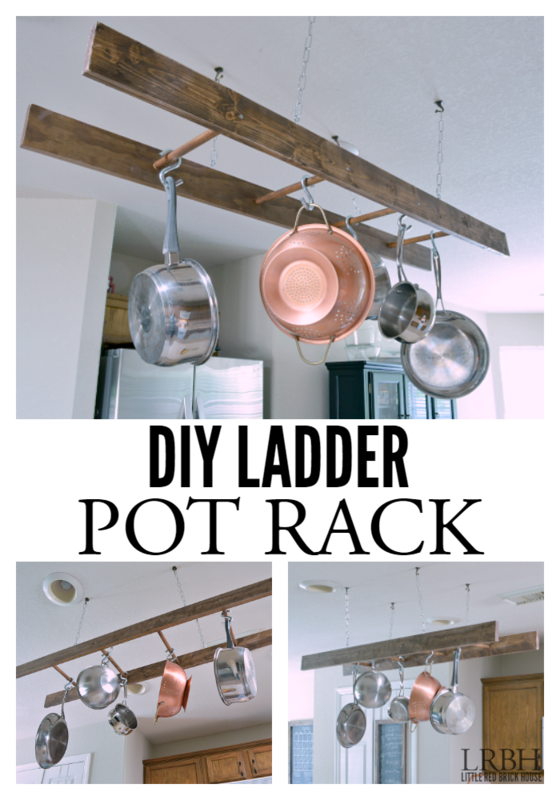 Hey Maryann, Absolutely loved this post and ladder looks amazing! Thanks for sharing such a wonderful post and I really appreciate your work and efforts on this post. Hope to see more DIY ideas from your side. Keep it up the good work! Innovative post. Sounds good. Interesting article. There are so many things that I have learnt after reading this write up. Thanks for sharing it. Keep up the good work. 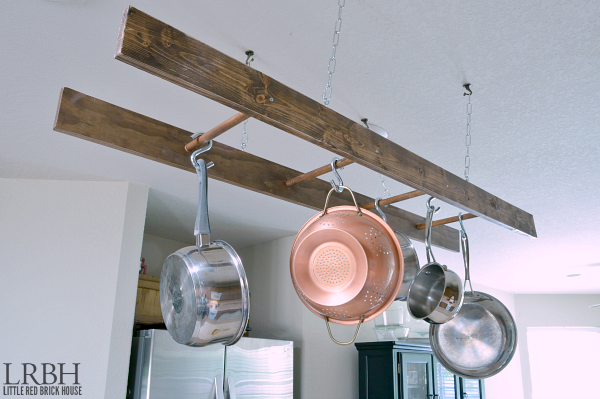 This is such a unique way to store your pots and pans! 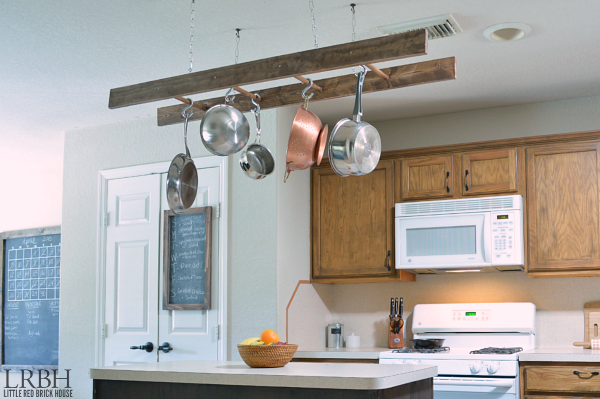 I’ll definitely need to try this for my kitchen renovation. Thanks for sharing! I love this! And now I know how to make a ladder! I really like the way it looks. Thanks for showing us how you did it. This is very creative idea! I have made something similar at my home last year from two old woods from my barn, it looks very rustic and natural. Thank you, Cindy! I just love the rustic look. I bet yours is gorgeous! Visiting from #SoMe2. I love that you just gave instructions for how to build a ladder! It could be used for decorating in so many ways! Thanks – and so happy to have discovered Domestically Speaking now too! Thank you so much, Susan! And Domestically Speaking is so awesome! Love Maryann and her beautiful work! I am SO in love with this! 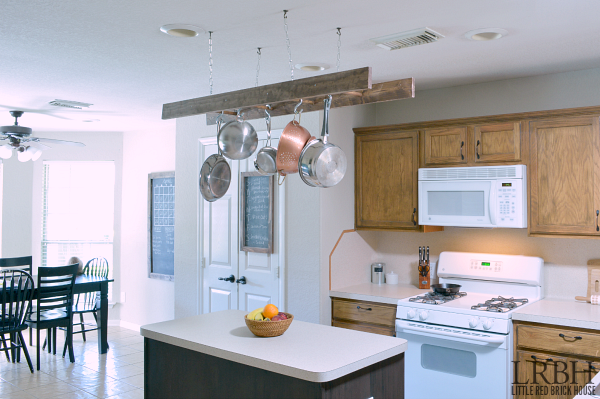 I’ve always wanted a ladder or gate pot rack hanging over my island! SO practical and pretty!!! PS. 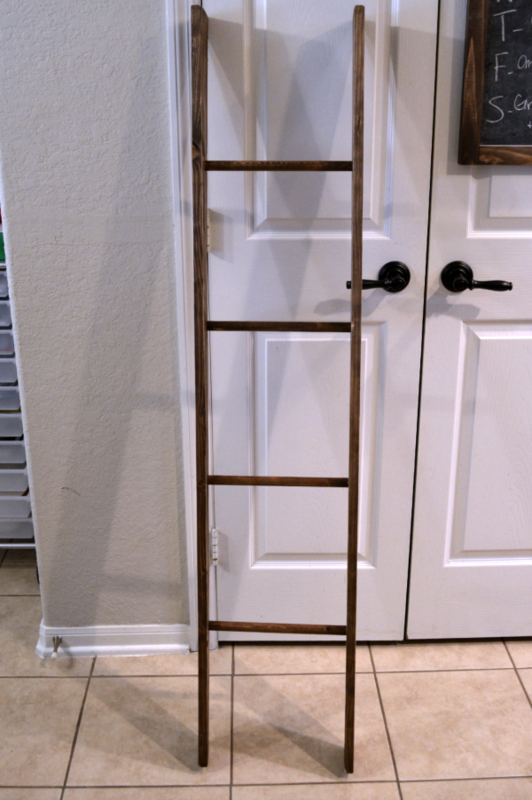 Funnily enough, I’ve got my own DIY ladder project coming to the blog tomorrow too! Great minds think alike girl! Thanks, girl! Haha! I can’t wait to see your ladder project. There really are endless options with ladders. The ladder rack looks great Sarah! Thanks for sharing and GOOD JOB!! Thank you so much, Leigh Anne!